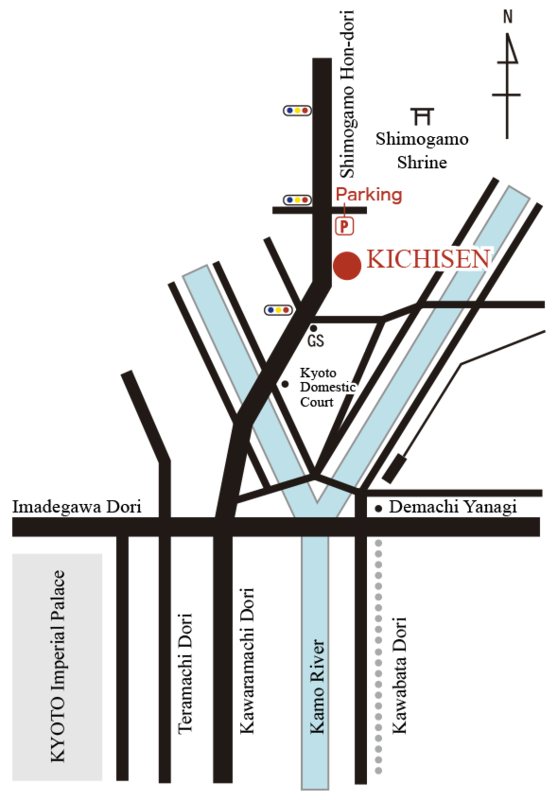 To make a reservation at Kichisen, please contact your hotel, tell them when you would like to dine with us, and ask the staff to call Kichisen at 075-711-6121 to arrange your reservation. 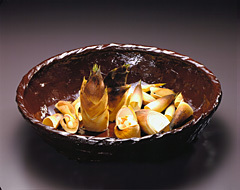 Please see the reservations page for more details. 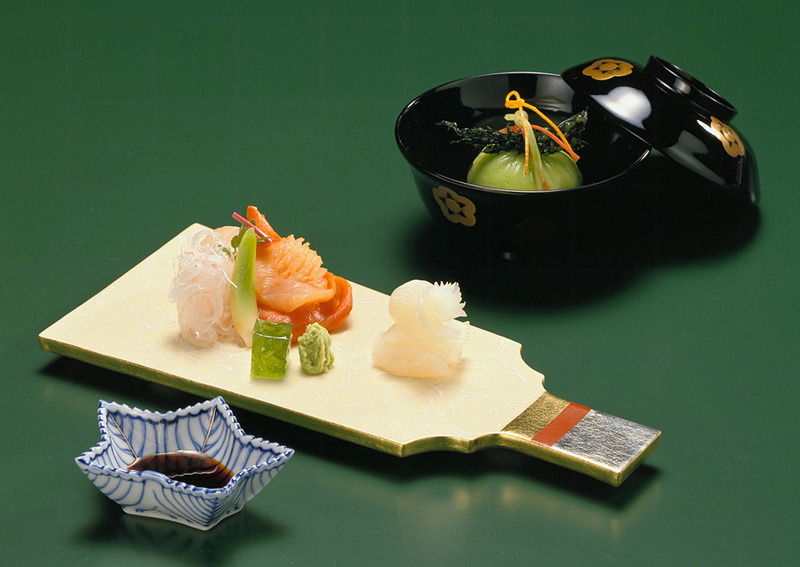 We look forward to hearing from your hotel, and to welcoming you in Kyoto. We are very proud to announce that we have retained our Michelin 3 Star for the 2019 guide. We are accepting applications for internships at Kichisen. Internships are unpaid, but successful applicants will be provided with uniform, a bed in the restaurant dorm, and full board on work days. Interested parties should send a resume (include nationality and languages spoken) to kichisen@mtj.biglobe.ne.jp, together with rough dates for the proposed stay. 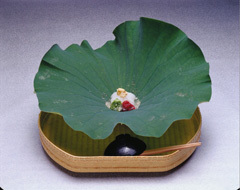 Kichisen is located in the vicinity of Shimogamo-jinja Shrine, a UNESCO World Cultural Heritage site. 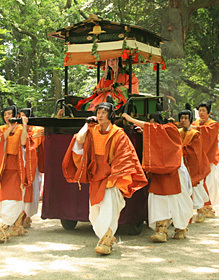 As if to connect Kichisen and the shrine, around them extends the virgin forest of Tadasu-no-mori, which is the only portion that remains of the ancient wilderness that once covered Yamashiro province (the southern part of Kyoto) some 2000 years ago. The mystical beauty of this forest has been celebrated in literature, from “The Tale of Genji” and “The Pillow Book” of 1000 years ago up to the present day. Because of the clear, quiet streams flowing in the forest, it is also referred to as the “Holy Land of Water.” Furthermore, on the south side of Tadasu-no- mori is Kawai-jinja Shrine, which is dedicated to Princess Tamayori, who was the mother of Emperor Jimmu, the first emperor of Japan. A replica of the thatched hut of the poet Kamo no Chōmei, renowned for his essay “An Account of My Hut (1212),” can be found on the grounds of the shrine. 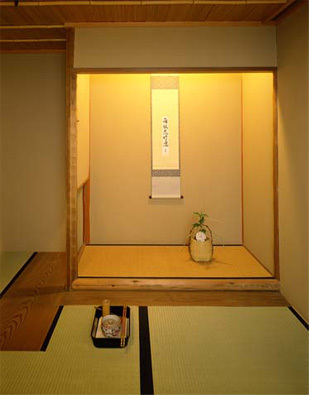 Here in this area blessed with history and nature, Kichisen continues its devotion to carrying on the traditional hospitality of Kyoto. 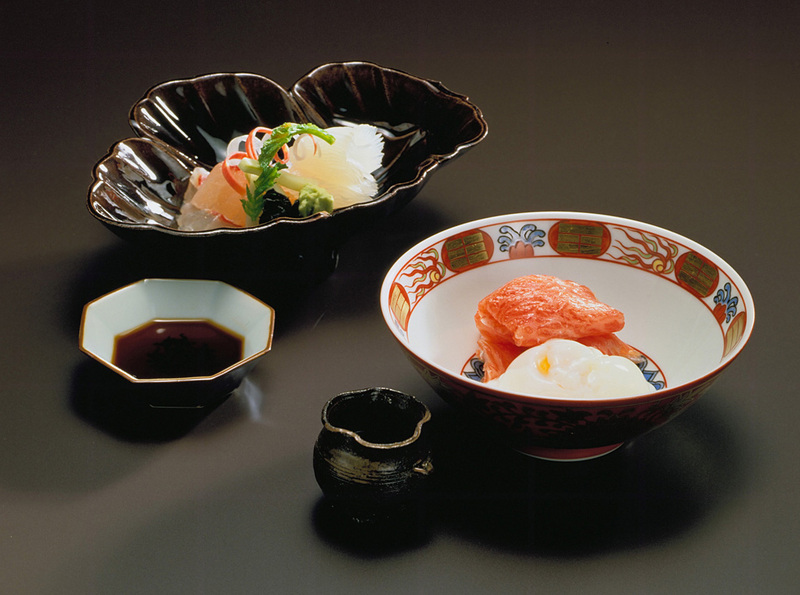 Acquiring a deep appreciation of cooking at the age of 9, he came to Kyoto at the age of 15 to start his culinary training in order to become a professional chef. 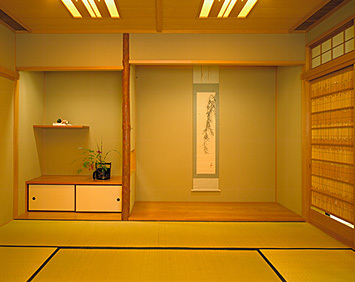 Although the Japanese restaurant he first entered as an apprentice was not a top-notch, Michelin-starred restaurant, he was able to cultivate an extremely refined and delicate aesthetic sense through traditional cultural arts such as tea ceremony, flower arrangement, incense ceremony, calligraphy and poetry, and studied with as many as 50 different masters during his youth. 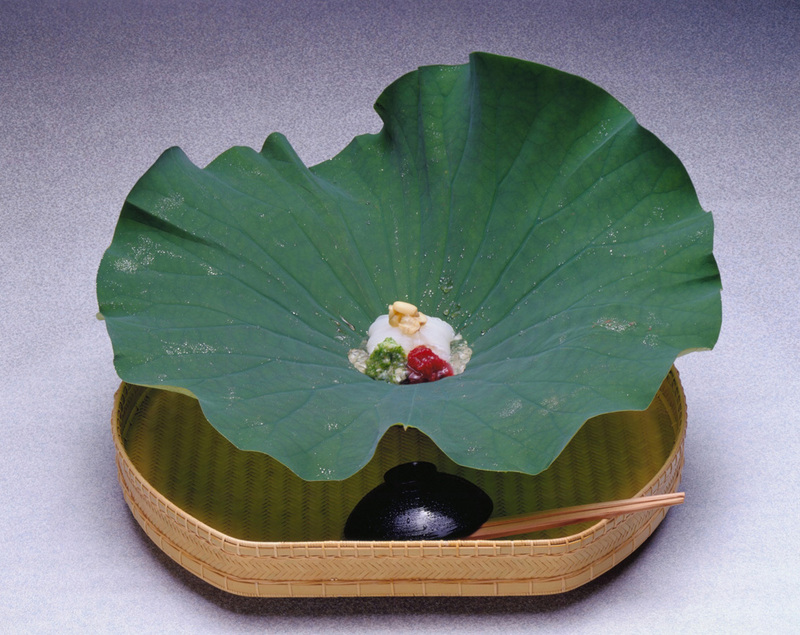 In particular, his encounters with a number of especially distinguished teachers,*1 which included Zen masters, noted tea masters and culinary experts, enabled him to delve deeper into the essence of Japanese culture and philosophy, enlightening him to the important mission of his cooking. 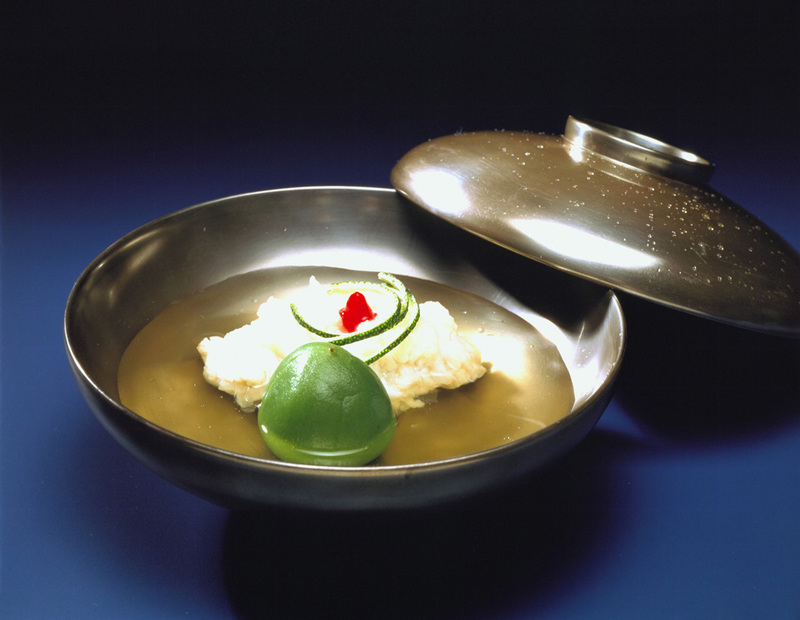 He incorporated everything he had learned from these masters into his unique style of cuisine, eventually becoming the executive chef at a Japanese restaurant in Arashiyama when he was only 26 years old. Since all the former executive chefs at the restaurant were men in their 40s, this exceptional promotion was welcomed with surprise. 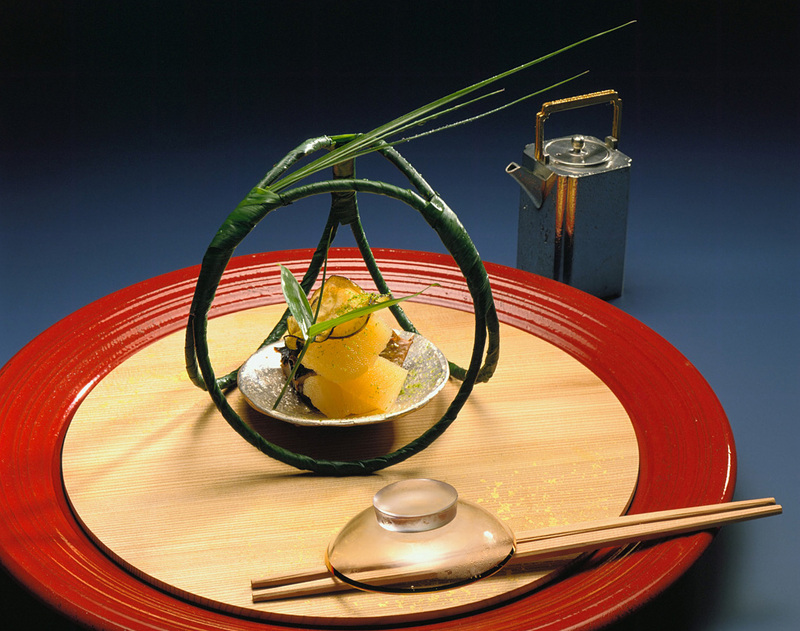 In 1983 he opened his first Japanese restaurant “KICHISEN” in a hotel in Kyoto at the age of 31, Two years later, he established his current restaurant near the Tadasu-no-mori forest in the Shimogamo area of Kyoto at the cost of 650 million yen (6.5 million dollars). 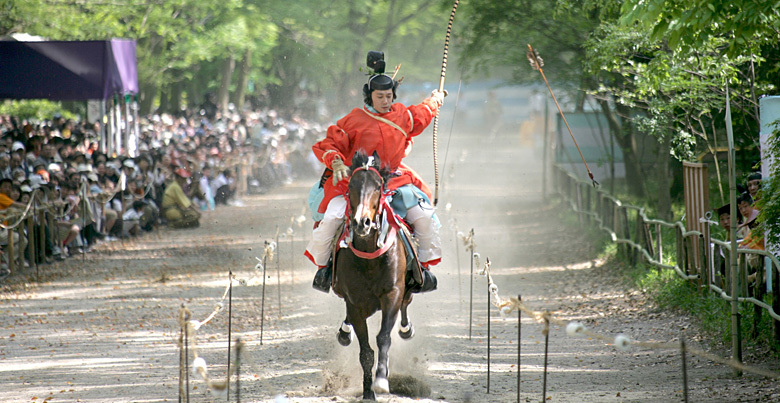 Interestingly enough, his ancestors were said to operate their business under the name of “KICHISEN” in the vicinity of this forest 800 years ago, and one might even say that destiny has brought Tanigawa back to this location, a place of such historical significance to his family. 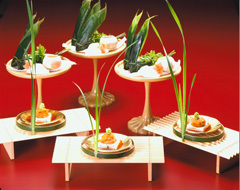 In 1986 KICHSEN was recommended by the New York Times as an epicurean restaurant specializing in kaiseki cuisine in Kyoto. 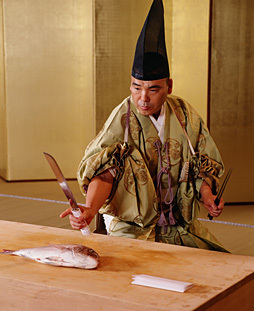 In 1999 he took part in a popular TV program called “Iron Chef,” in which master chefs are pitted against one another in a culinary competition. 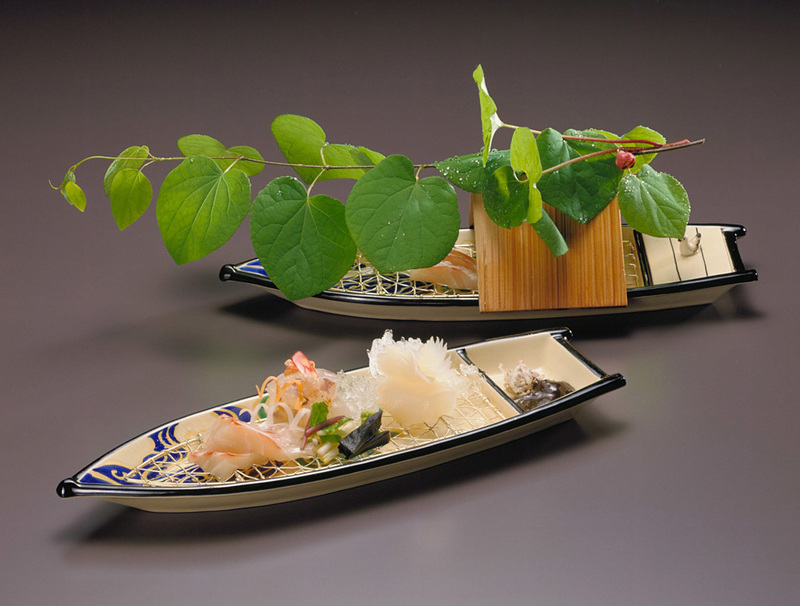 He soundly defeated master chef Masaharu Morimoto, then executive chef of the Japanese restaurant “NOBU” in New York, in a clean sweep of the contest, in which the chefs prepared their specialized dishes using dagger-tooth pike conger eel. His dexterity in preparing the dish won the admiration of all the judges. KICHISEN was awarded with 2 stars in the Michelin Guide from 2010 to 2013, and 3 stars from 2014 to 2019 consecutively. He has established his reputation in one generation, climbing all the way up to the level of the most well-established restaurants. 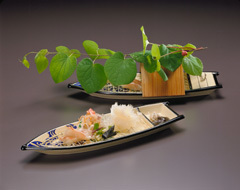 In recent years, he has constantly explored new fields and new possibilities, such as popularizing traditional court-style cuisine (yusoku-ryori) and its cutlery methods (ikama-ryu), creating a special curative, low-calorie kaiseki cuisine catering to those suffering from diabetes, and promoting Kyoto-style cuisine abroad. 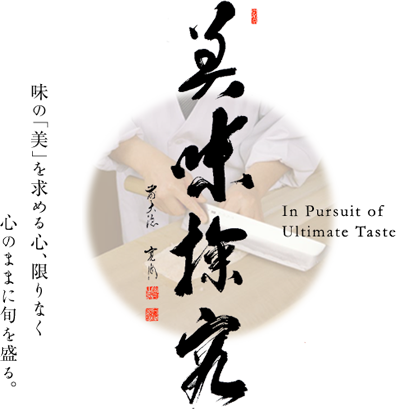 Furthermore, his uniquely strict but warm teaching style toward apprentices, unparalleled in other restaurants, has been featured in many TV programs specializing in the theme of “human resource development,” such as “SODATERU” by the Japan Broadcasting Corporation (NHK) and “Japanese Education – Scolding People in Japan” in the “WAFU SOHONKE” series by TV Tokyo. 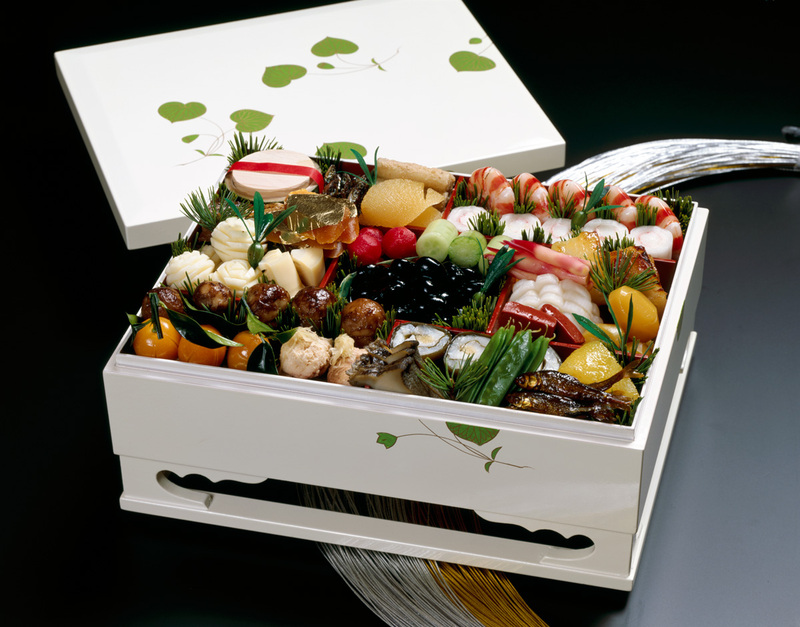 In one TV program, a young Japanese comedian came to his restaurant in order to experience apprenticeship for one day. 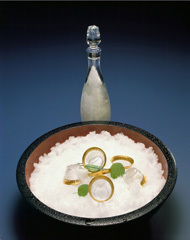 Among these strands, at Kichisen we focus especially on serving the authentic hospitality cuisine in the tradition of the “cha-kaiseki.” In Japanese, the word “gochisō” (feast) originally meant that the host had raced around on horseback to gather the ingredients for his guests’ meals, and thus expressed hospitality. 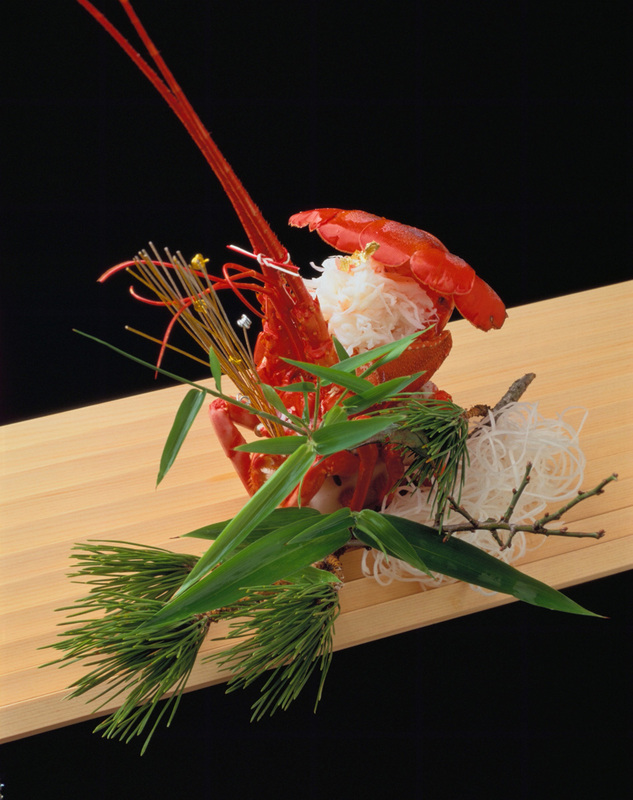 At Kichisen, we follow this philosophy as we gather delicious seasonal ingredients from throughout Japan and offer them to our guests. 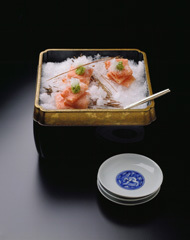 There is a certain story, rhythm and subtle charm which pervades the progression of the courses in Kyoto cuisine. We begin with a “drink offering” called “sake-ikken,” meaning “a sacred sake offered to the gods,” in order to extend our hearty welcome and gratitude to our guests. 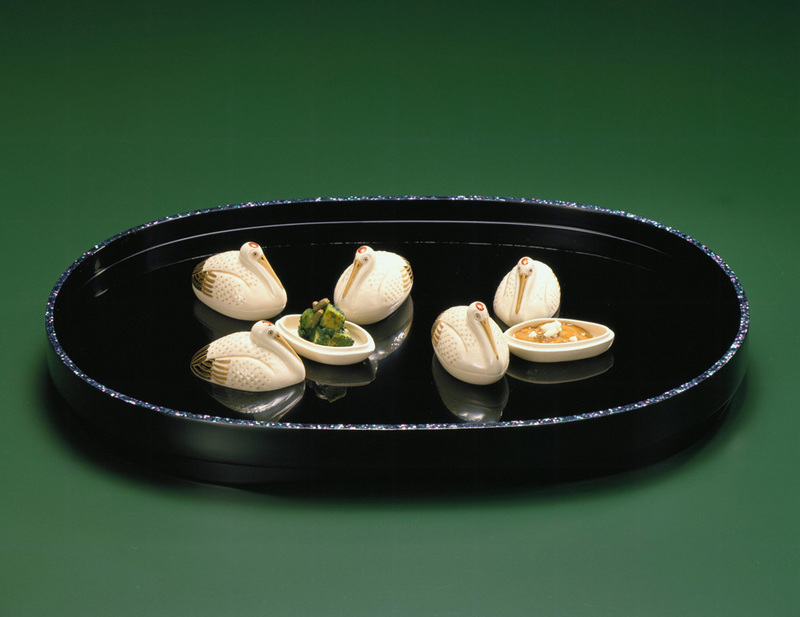 Different from the appetite-enhancing “aperitif,” “sake,” which is considered to be most delicious beverage human-beings have ever created, is first offered to the gods, and then presented to our honored guests. 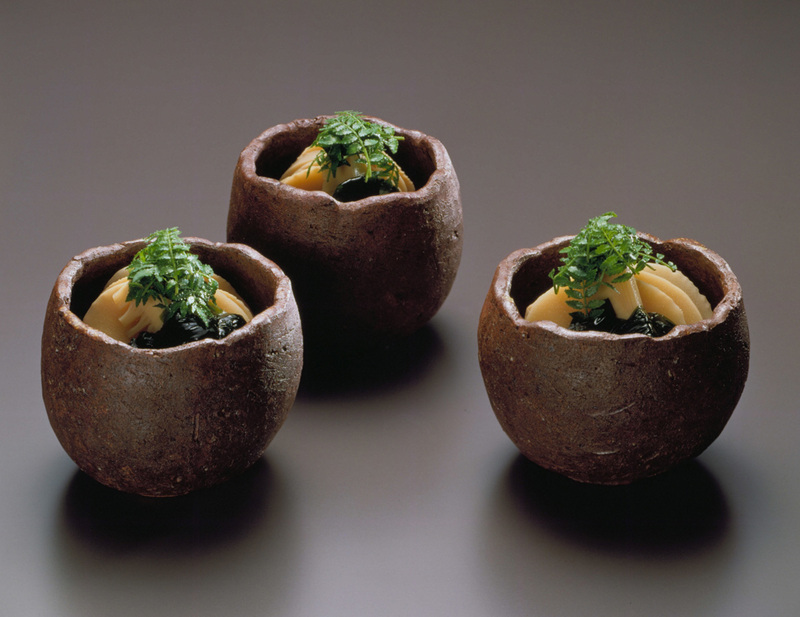 After the “sake-ikken” and the appetizer called “sakizuke,” the meal proper will ensue. The first dish to be served is a clear soup called “o-wan.” At Kichisen, we sprinkle drops of dew over the lid of the “o-wan” bowl, in order to add a cool and refreshing feeling. This expresses our dedicated spirit of hospitality, that our cuisine has been created just for this particular guest, never touched by anyone else. In partaking of the soup, please enjoy the smell of the season the moment you open the lid of the bowl. 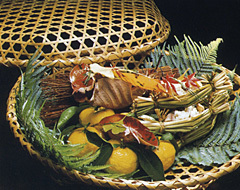 Pepper leaf buds in spring, green citron in summer, yellow citron in autumn and ginger in winter exude seasonal flavors. 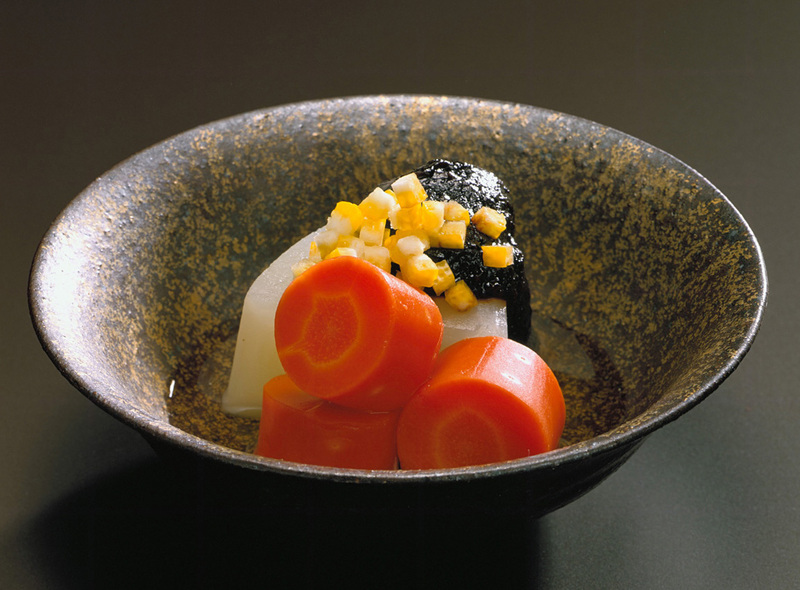 Please take a sip, and enjoy the distinct flavor of the dashi soup stock only available at Kichisen. 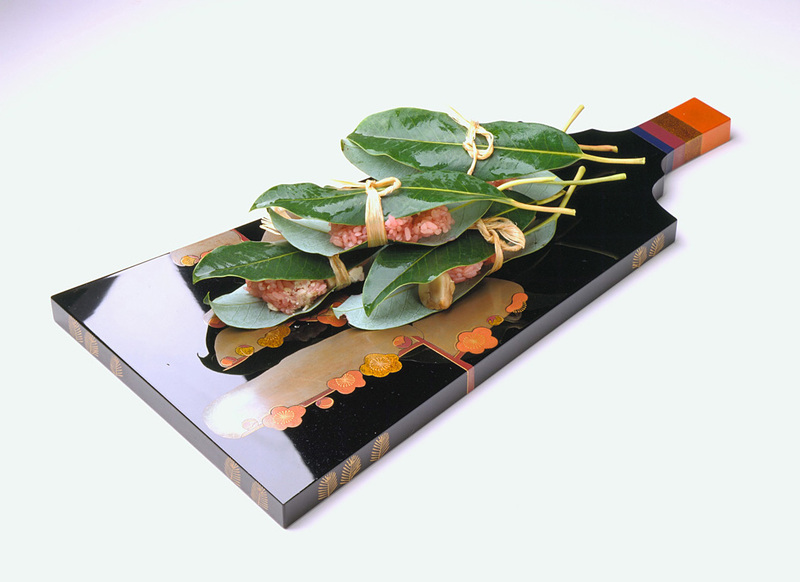 Dashi made from kelp and bonito flakes is the most essential, and indeed fundamental element of Kyoto cuisine, and is therefore the most important responsibility of the chef. 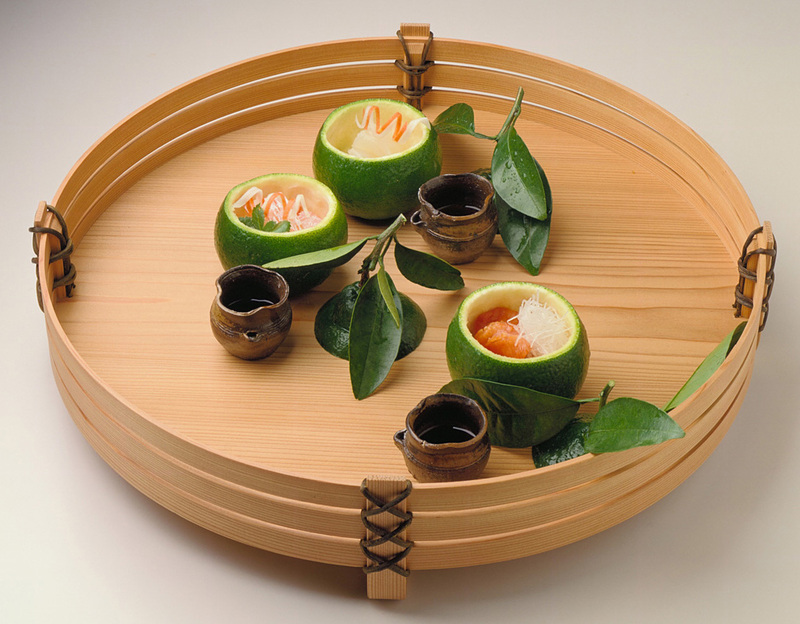 Remove the aromatic ingredients untouched from the bowl, put down the chopsticks, and enjoy another sip. With the flavor of the soup, a delicate sensitivity toward the seasons will permeate throughout your body. 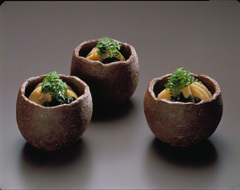 Alternately partaking of the morsels in the soup and drinking the broth will enable you to enjoy the soup to the fullest. This completes the first part of the meal. 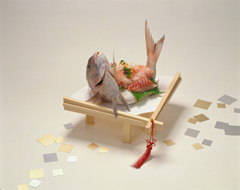 Next comes the “mukōzuke,” a sashimi (raw fish) dish. 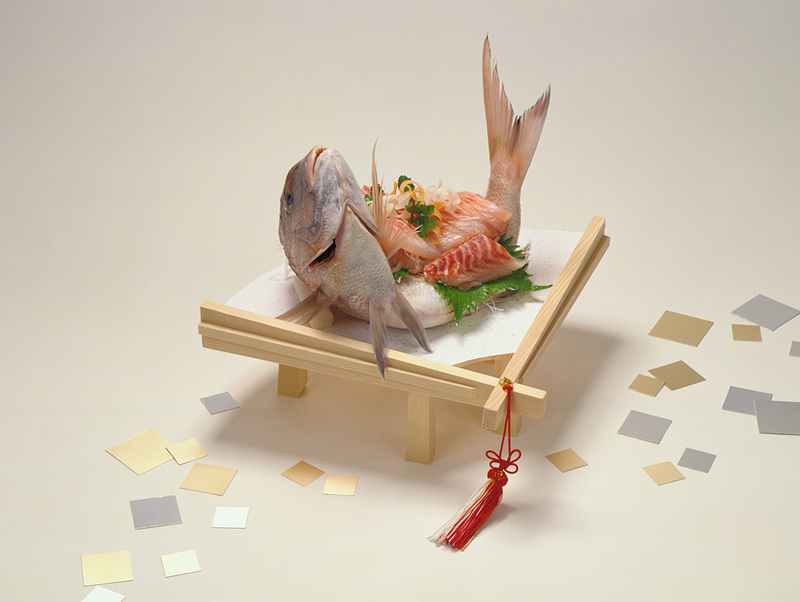 Originally from tea ceremony cuisine, the sashimi was placed on the far side (“mukō”) of the rice and soup bowls, which led to this name being used for this dish. 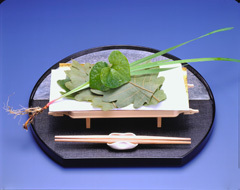 The “mukōzuke” dish is accompanied by seasonal condiments, such as mountain pepper, radish, flowering cucumber, oba perilla leaves, “bofu” or Java water dropwort (Japanese parsley), “matsuna,” or Japanese mustard spinach, “iwatake,” or rock tripe (edible lichen), “hasuimo,” or stem of taro, “hojiso,” or ear perilla leaves, Japanese ginger, squash (pumpkin), Malva nut, river weed, Malabar spinach (Malabar nightshades), plum pulp, Japanese red kintoki carrot, Japanese spikenard, kurokawatake mushroom (edible mushroom in the Thelephoraceae family), noble orchid (Cymbidium goeringii), bracken, red manganji chili pepper and smartweed (water pepper). 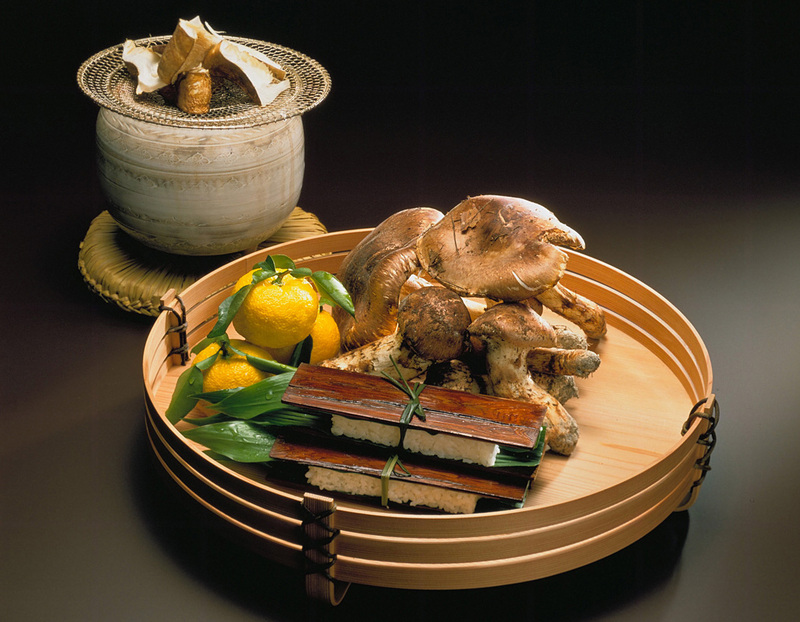 Many of these ingredients also serve as Chinese medicines. 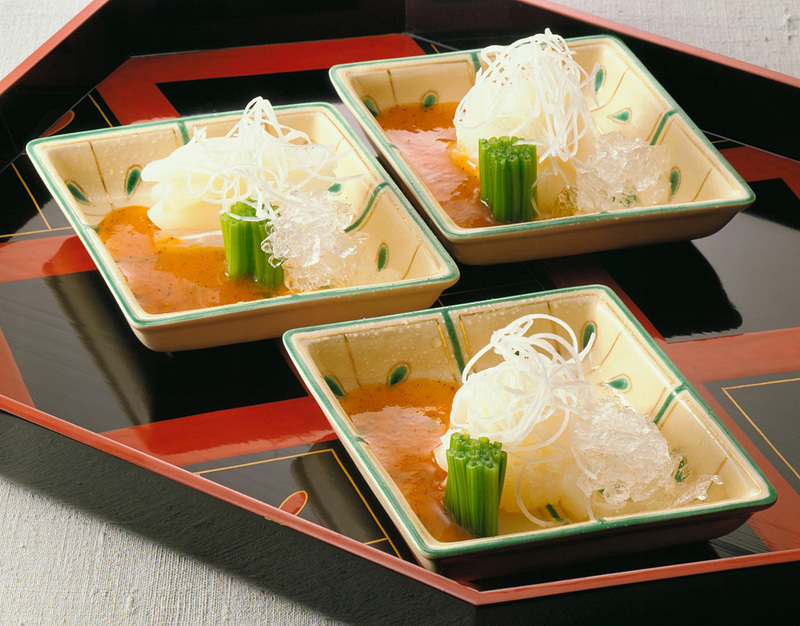 Eating them together with sashimi will not only help digestion and absorption, but also enhance the succulent flavor and sweetness of the sashimi. 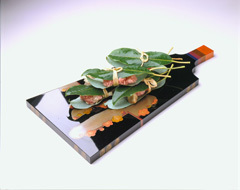 As seasonings, soy sauce and chirisu (a citrus-based vinegar soy sauce mixed with grated radish and smashed leek) are available. 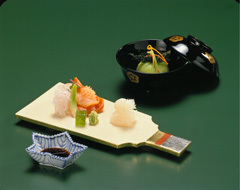 If using soy sauce, only a pinch is necessary for sashimi. 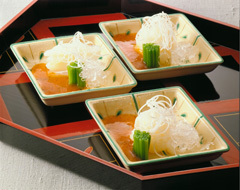 If using the chirisu, dip the sashimi well into the sauce, and top it with plenty of grated radish. 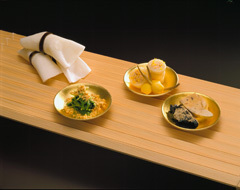 Then comes the “nakazara” (middle dish) often including sushi or a steamed dish. After the “nakazara,” the flow of dishes quickly builds toward the climax of the menu. 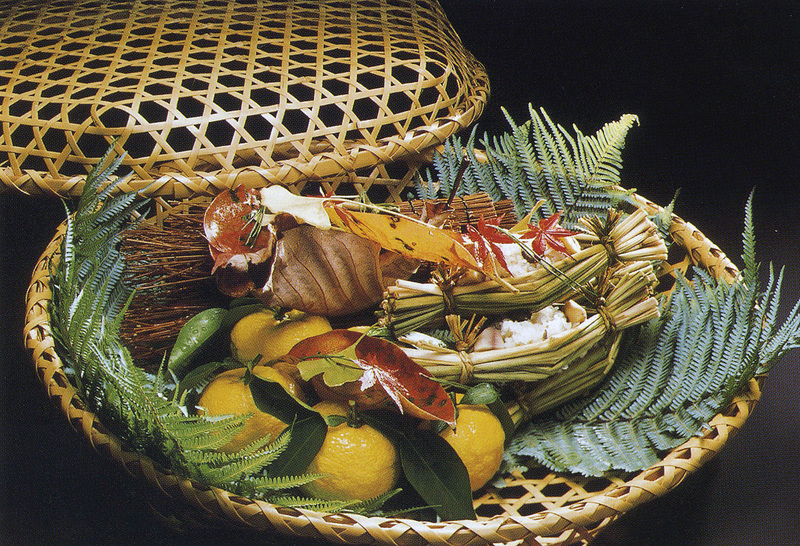 Entertaining our guests as they enjoy their drinks, we then serve the “hassun,” a mixed platter of tastes from both the mountains and the sea. 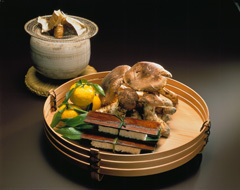 The next dish is a “nimono” (boiled) dish, followed by a “yakimono” (grilled) dish, which are basically considered as the main dishes. 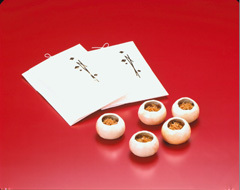 Afterword comes the “kuchi-naoshi” (palate refreshment), which serves as an interlude. 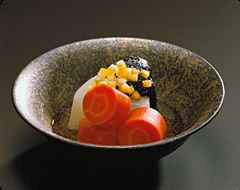 The final part of the meal consists of rice and pickled vegetables. 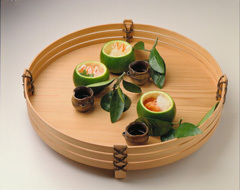 Lastly, the meal concludes with fruit, sweets, and powdered green tea. Needless to say, we contrive to express the shifting of the four seasons, and through sensitive attention to detail concerning factors such as the beauty of appearance, aroma, and texture, we carefully maintain the delicate balance of the five flavors (sweet, salty, bitter, sour, and “umami” savory) and the five senses. 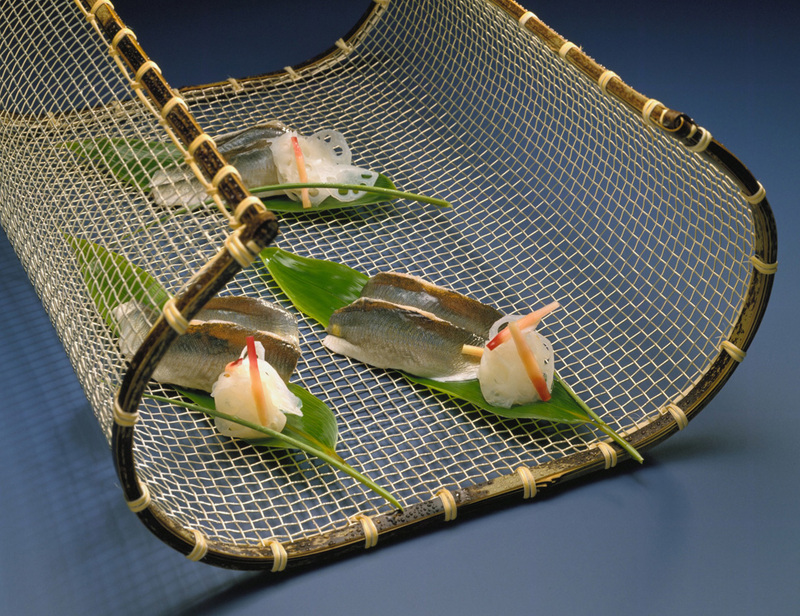 While in comparison to Western cuisine you may find the seasoning quite light, please enjoy the subtle tastes of the ingredients and the depth of flavor. 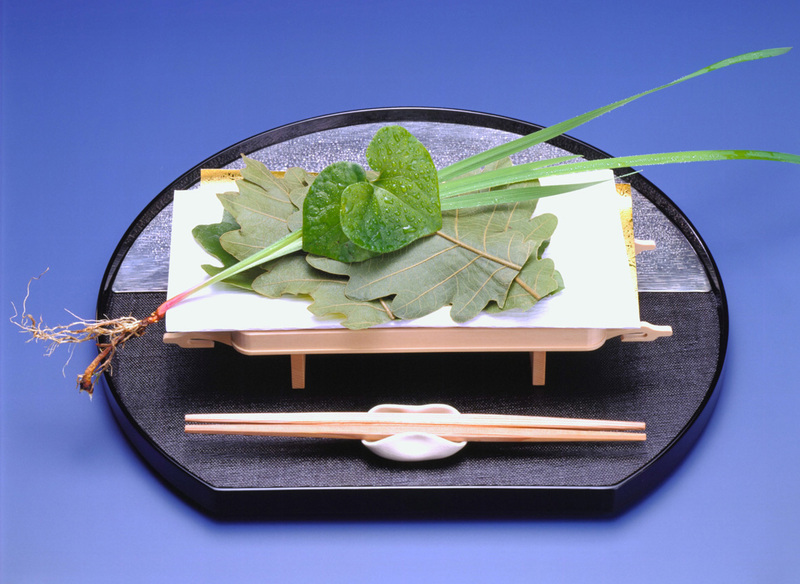 We should be happy if this Kyoto cuisine may, as it unfolds like the flow of an elegant poem, gladden your heart and invigorate your life. * Courses under 22,000 yen do not include the “hassun.”* The lunch menu enables you to enjoy a course featuring the main dishes. This means “You and I, we are together at this single meeting. 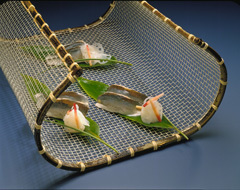 Without hiding our hearts, let us speak thoroughly of anything and everything.” Likewise through Kyoto cuisine, might not the cook and guest be able to establish a reciprocal relationship which enables the sensitivity of their hearts to reverberate in unison as they share a unique experience and its ensuing feelings of happiness, contentment and peace? 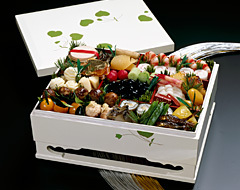 We devote ourselves daily so that you may take away with you the most from this single meeting. 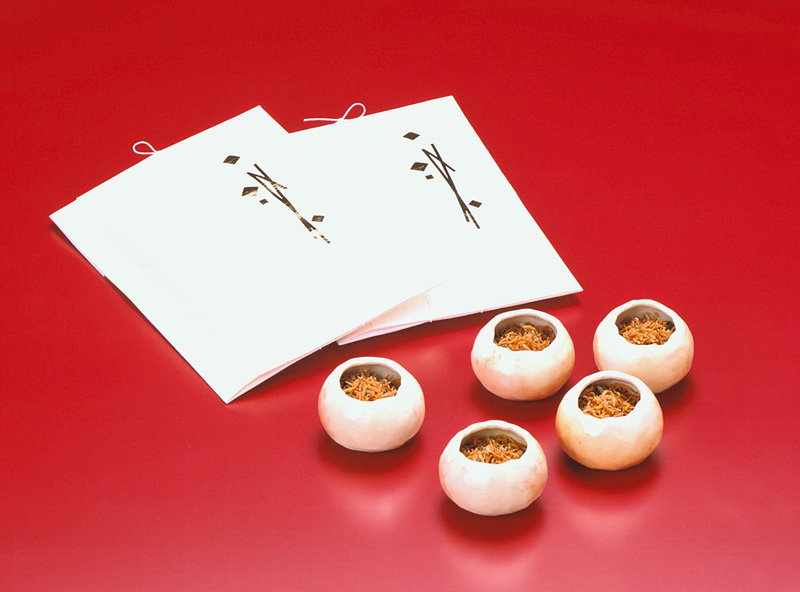 Please do not hesitate to ask the staff about the menu, the food, or anything that may be unclear. 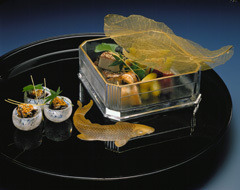 * Please note that the contents of the menu will vary depending on the seasonality of ingredients. *available only on weekdays of the following months : February, March, May, June, July, August, September, October and December. 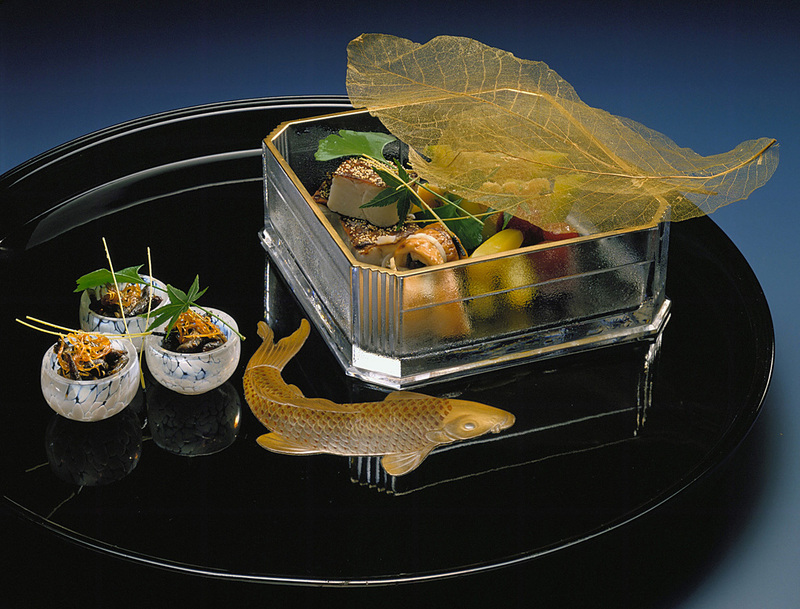 Kaiseki cuisine is characterized by the finest ingredients selected in accordance with each particular season, especially prepared to present each guest with a singularly unique, sensual dining experience. 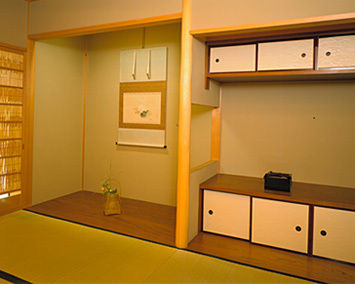 We await your visit with perfect settings and a seasonal code of etiquette, in the quiet surroundings of the Tadasu-no-mori Forest. 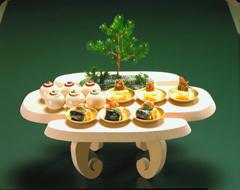 The tea ceremony is a comprehensive art form polished and perfected over centuries. 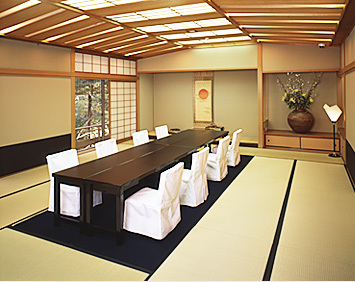 Taking the hospitality of the tea ceremony to heart, we have constructed the tearoom “Suisho-an.” Originally built in 1935, it was relocated, and named by Kowatari-an, the head priest of Kennin-ji Temple. Simplicity rather than splendor, modesty rather than flamboyance, humility rather than extravagance. 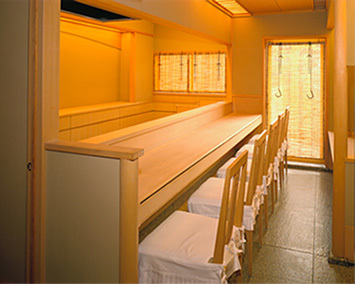 The frugal, serene atmosphere of the tearoom develops a keen awareness of one’s surroundings – the beauty of a single flower, the dazzling light of the sun, the breath of the wind and the richness of each dish. 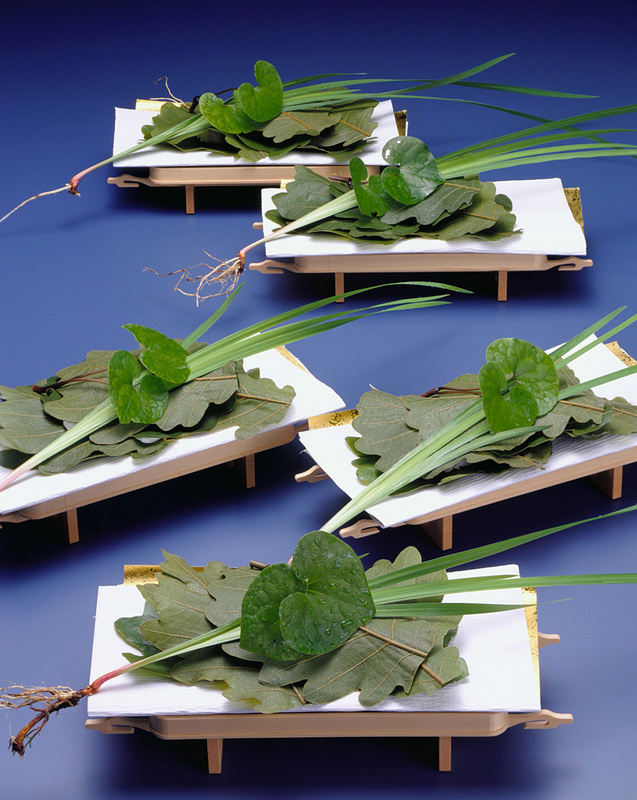 Starting with the New York Times over 25 years ago (Exporting Japan’s Way of Tea, Daniel Goleman, The New York Times, October 5, 1986), Kichisen has been featured in numerous articles and television programs, a sampling of which are offered below. 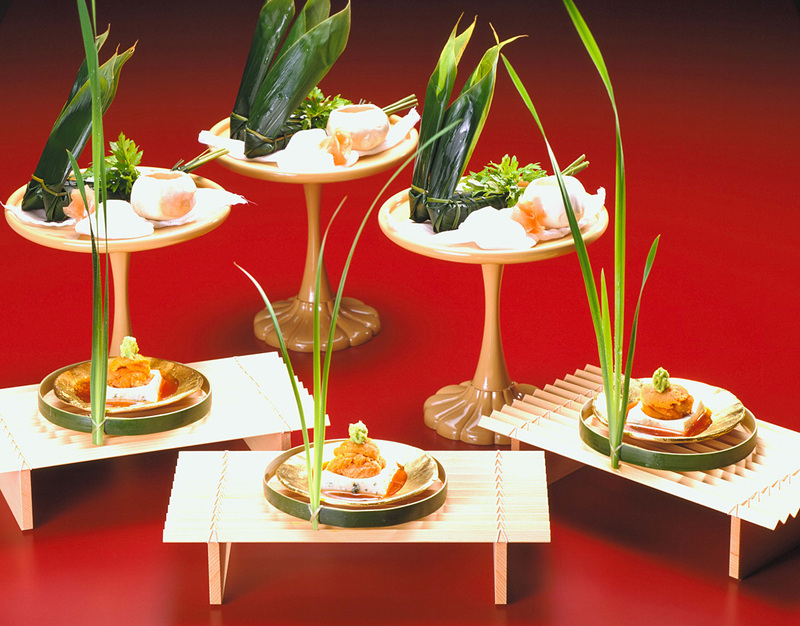 In 2013, Kichisen was selected by Foodie as one of the Foodie Top 100 Restaurants: Japan. 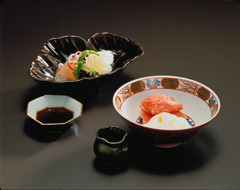 Kichisen is a ryotei (Kaiseki restaurant) located beside Shimogamo shrine, a World Heritage Site. 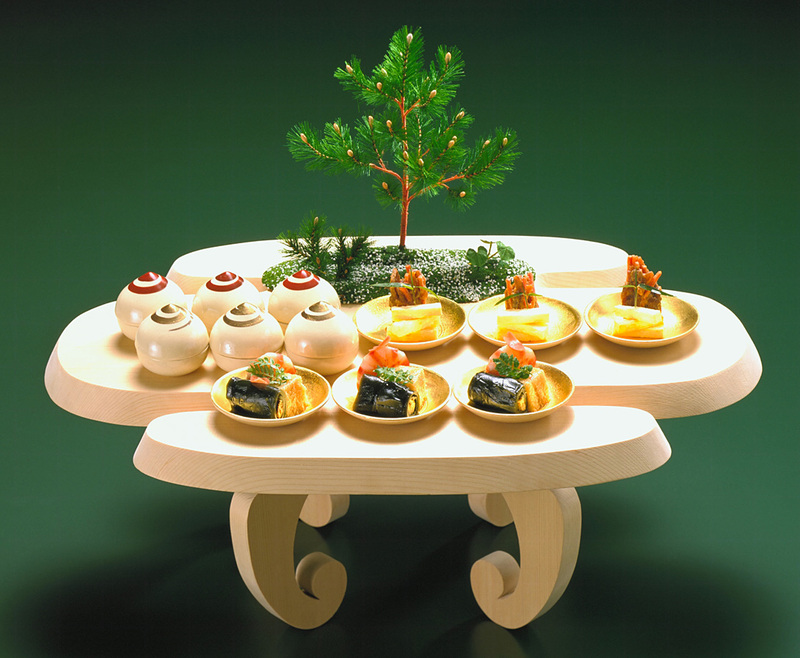 Please have the hotel or ryokan you are staying at contact us, and inform us of your desired date, number of people, time, which menu, your name, etc. In case of cancelation, please contact us by the day before. In this case there will be no cancelation fee. However, in case of cancelation on the day of the reservation, full payment will be required. We recommend that you come by taxi. 5 minutes by taxi from Imadegawa Station on the subway line. 10 minutes on foot from Demachi-yanagi Station on the Keihan line.